North Conway Ski Resorts and Other Ski Areas. 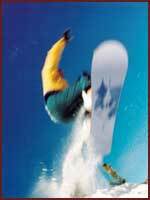 A number of New Hampshire area ski resorts are easily accessible to our bed and breakfast guests. During your stay with us in North Conway, NH, you can enjoy White Mountain skiing, as well as a number of other great wintertime activities. After a day on the slopes, come back to the cozy accommodations at the inn, have a restful night's sleep, and savor a delicious, hearty breakfast in the morning; you'll be ready for another day of skiing, exploring the local attractions or whatever the day has in store. Explore two mountains, Attitash and Bear Peak and discover exciting terrain, great snow, excellent grooming, and a friendly staff. In 1965, the founders of Attitash wanted to build a ski area for their friends to come and enjoy with them. There are the amenities you expect and the Mount Washington Valley has everything you'll ever need in a resort town. Beginners can relax and improve their skills on Sugarbush and Black Beauty. Experts, test your skills on the super steep Mr. Rew or the winding narrows of Upper Galloping Goose. Check out the Lostbo Glades or Carter Notch for some of the finest tree skiing in the East. Whatever your ability, Black Mountain has something to offer. Largest alpine ski area in New Hampshire and one of the largest cross country ski areas in the East, Bretton Woods Mountain Resort is known for its tremendous snow conditions and spectacular mountain views. New for 2009, a year-round Canopy Tour: a series of treetop zip lines connected by suspension bridges and hiking trails. High in beautiful Franconia Notch, is New Hampshire's version of Shangri-La. In just eight minutes you can soar to Cannon's 4,200 foot summit on our 80-passenger aerial tramway. Or visit Echo Lake at the base of the mountain - while the kids enjoy the crystal clear water and play in the sand, you can relax on the white sandy beach. Later tour the covered bridges and glacial formations at the Flume Gorge. 80% of our terrain is designed for novice and intermediate skiers and riders. Our wide, beginner-friendly trails, impeccable grooming, and reliable snow makes King Pine the ideal place to ski or ride, day or night. However, adventure can be found on Pitch Pine (one of New England's steepest trails!) or in our terrain park, with hits, rails and a professionally-groomed halfpipe. Shawnee Peak has one of the LARGEST lit Park/Pipe Combos in New England! The Halfpipe is a full 400' long and 44' from lip to lip - a perfect size! The Terrain Park is always changing! The Grommet Garden is a new beginner park for those just learning to spin and jump. Located between West Slope and Happiness Is, the Grommet Garden is a great place to learn the art of jib! Eight Peaks and Infinite Terrain. Sunday River features 131 trails spread across eight interconnected mountain peaks, each offering a distinct experience. Summer activities include: ATV Tours, Canoe & Kayak Tours and Rentals, Fishing Trips, Horseback Riding, Wagon Rides, Lighthouse Tours, Moose & Wildlife Tours, Nature Hikes, White Water Rafting, Photography Tours, and golf. Ride New England's most powerful Quad chairlift, Access 2,112' vertical in just 6 minutes, Ski & ride NH's most playful terrain, Discover high elevation and the most natural snow, Ski 3 continuous miles of beginner terrain, from the summit - on the Polecat, Experience the magic of spring skiing in Mar/Apr. Find the Best Ski & Snowboard School. Enjoy the Pub & Restaurant for lunch & apres ski. Summer activities include: Ride NH's highest 4-passenger Gondola Skyride - the Wildcat Express for the East's best scenery! Fly the ZipRider cable ride! 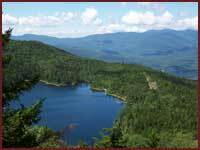 Hike along the Appalachian Trail or Fish Wildcat Pond, stocked with trout. Bear Notch Ski Touring Center - www.bearnotchski.com Just three miles west of Attitash in Bartlett Village, Bear Notch Ski Touring Center is cross-country skiing and snowshoeing the way it was meant to be. Over 65km of trails with state of the art grooming, gentle beginner terrain and challenging expert trails, past riverside and pristine waterfalls. Professional ski school and guided snowshoe nature tours. Bretton Woods Mountain Resort - www.brettonwoods.com On the grounds of the historic Mount Washington Hotel and the White Mountain National Forest, the Bretton Woods Nordic Center is one of the largest cross country areas in the East. The 100-km trail network crosses open fields, meanders through woods of spruce and fir, passes beaver ponds and mountain streams, and traverses open hardwood stands. Enjoy classical and skate skiing or snowshoeing on trails painstakingly prepared with our state of the art groomers. And don't forget to stop off at the warming yurt or the rustic, backcountry cabin on Mount Stickney. Great Glen Trails Outdoor Center is in New Hampshire at the base of 6,288 ft. Mt. Washington, the highest peak in the Northeast. Wherever you go the views and mountains of the Northern Presidential Mountains and White Mountain National Forest surround you. Summer activities include: hiking, mountain biking on their diverse trail system of carriage roads and single track. Bring your own bike or rent one of our high quality Cannondale mountain bikes. Great Glen Trails has exciting paddling programs with guided kayak or canoe tours on the lakes and rivers of Northern New England. Float through a wildlife refuge or challenge yourself in the rapids. Jackson Ski Touring Foundation - www.jacksonxc.org The Jackson Ski Touring Foundation is a community based not-for-profit 501(c)3 organization, chartered to maintain trails in and around the village of Jackson, NH. The "Foundation" maintains 148 km of trails that are considered the finest cross-country ski trails in the Eastern United States. We present state of the art grooming on trails designed to suit every taste and ability, whether you prefer quiet striding through old growth New England forest or all out free technique on international race courses. All this is contained within a charming New England village that takes pride in its long established traditions of great skiing and warm hospitality. Cross country ski or snowshoe over 65 km of trails, groomed for both classical skiing or skate skiing, through riverside hayfields, mountainside spruce and hemlock forests offering a diverse selection of terrain for all abilities from easy rolling hills to more challenging intermediate and back country trails. These trails connect Intervale, Kearsarge, North Conway and Mt. 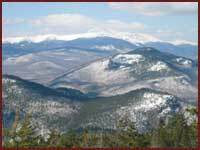 Cranmore, offering outstanding scenery with views of the Saco River and magnificent Mt. Washington. The only cross country ski touring and snowshoe network in North Conway Village. 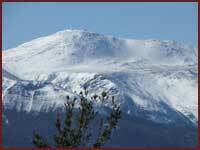 Visit a North Conway Ski Resort This Winter! !